Amber is a fossil resin of coniferous trees, but also other species of trees and shrubs that originated millions of years ago. For example, well-known amber from Baltic area was originally resin which hardened and turned into something similar to the stone. To perceive the healing potential of thousands or millions years old resin and amber, is important to become sensible and perceive the flow of bioenergy inside yourself but also around yourself and inside of other persons. Sensible person sees bioenergy and magnetic fields of the magnetic core of the planet Earth. He even learns to perceive by oracular techniques transfer of own consciousness through energy fields in the space. For this he needs to build astral body from own energy in bones. Mental penetration throughout energetic magnetic fields is possible and for this is necessary natural sense where you don´t see difference between yourself and other people, living objects and objects in total. This is natural shamanic consciousness. Then there is the possibility of consciousness training as in identical twins or Siamese healed individuals. Then there is the possibility of training some conditions how in those disfigured from birth. Here is also the possibility of transferring of knowledge and perception of divination through early stages of clinical death, which is possible to practice. The aim of Reiki practice is the ability mentally out of yourself find the object such as resin and various kinds of amber. This is not a connection to imaginations of amber and people that do something with it. This is not about imaginations of amber in energy aura. At the distance, you can look for someone who has Reiki consecration and extremely actively searches and processes amber. You connect to such person and let yourself to consecrate by this person to Reiki amber. It’s good for you to have Reiki consecration and find living persons and you consecrate them and back you receive consecration from such persons. It is good that you take a person who permanently and constantly looks for amber and constantly processes amber and turns it into new pieces. It is important to choose such individual. Below we explain in more detail why it is important to proceed it in this way. How initiation into Reiki runs? One possibility is that Reiki master sets Reiki in your imaginations and always when you think of Reiki, you activate Reiki. Of course such level is very weak. Upper level is when Reiki master sends the consecration through own tiny child thymus glands into your child thymus glands. This is better level. Then here is even stronger level and you get Reiki consecration based on building astral body from bone energies. There are also other Reiki possibilities but those are practiced only exceptionally at the level of chromosomes and genes. But there are only few such Reiki masters. Unless someone consecrates to Reiki at distance without the presence of an individual, then usually uses astral journey or wandering through the clinical condition of dying. Reiki consecration could be boosted by hypnosis and trance. Mental connection to persons who during their life process amber is generally quite difficult, because such people have extremely effective chemistry and chemicals in the body. And often it is also for sensible person issue how to penetrate into the body and the psyche of such amber personality. We examined why amber personalities are like impregnable fortress and we have found out that they have 300 times more powerful chemistry than chemistry of normal adult and this is really an insurmountable barrier. And Sasa Pueblo many years struggled to get inside such persons. And he waited patiently and program his mind for penetration into amber personalities. Finally he succeeded thanks to unique healing foil Polimedel which is Russian production. Military research for Russian army developed something like teflon special nanotechnology healing limpid foil for faster wound healing and soldiers return to combat conditions. Russian producers themselves on their page describe that similar material in nature is only natural amber and thus resin. They argue that this teflon coated foil collects strong negative electron charge. And it is logical that amber will constitute such a charge. We started with classical esoteric research based on prophetic testing of everything around strong negative charge. We have focused on long-living persons, thus one of 100 people with the potential live to 100 years. And indeed they are naturally forming strong negative electron charge. People who do not have the potential to accomplish even 60 years have strongly positive electron charge and extremely poor performance of chemicals. In long-living individuals with strong electron charge is a chemical performance up to 200 times higher then in people who have the condition live to the age of 60. We have reviewed hundreds of individuals by oracular methods. Then we have tested by oracular techniques and sensibly healing foil Polimedel. Indeed, its usage evoke 300 times higher performance of chemicals than in normal individuals. Of course, after about second week of usage negative electron charge decreased. Even so, people in the test described that they feel excellently. Thus, we can conclude that Polimedel foil is something like a small miracle. We decided to test amber personalities how negative electron charge they have. We had a fear that we will not be able to penetrate inside them. For penetration into amber people we need to have similar performance of chemicals as they have. And healing foil Polimedel helped us to get into the amber people. And that was another success of healing foil Polimedel and I am not involved into advertising or its sale. Thus, whenever I want to connect to the amber person, I´ll do it through healing foil Polimedel or people who work with this foil or people who currently treat with the foil. It can be stated that healing foil Polimedel opens the way for us to amber Reiki and we are glad for this. We decided to examine the negative electron charge in amber. Unless amber get close to a human has strong negative electron and a positive charge is suppressed. It is true that older untouched amber, the stronger negative electron charge. But when someone starts giving found amber near the man and thus live biological person then electron charge of amber disappears, discharges within the body and amber finally recognizes the positive electron charge and longer do not have healing aspects. Therefore by touching amber, original negative electron charge will discharged and never will charged again on negative values. Something similar reports teflon healing foil Polimedel. Thus, if we would like to have lasting therapeutic effect of amber or medicinal tape then we would have to get after a month or a little longer time some virgin amber untouched by human hands. That wouldn´t be financially possible by normal Reiki person. But the person who process amber as the base of own livelihood has constant supply of new pieces of amber. Amber has medical effect but only a certain period of time then it has no healing energy. 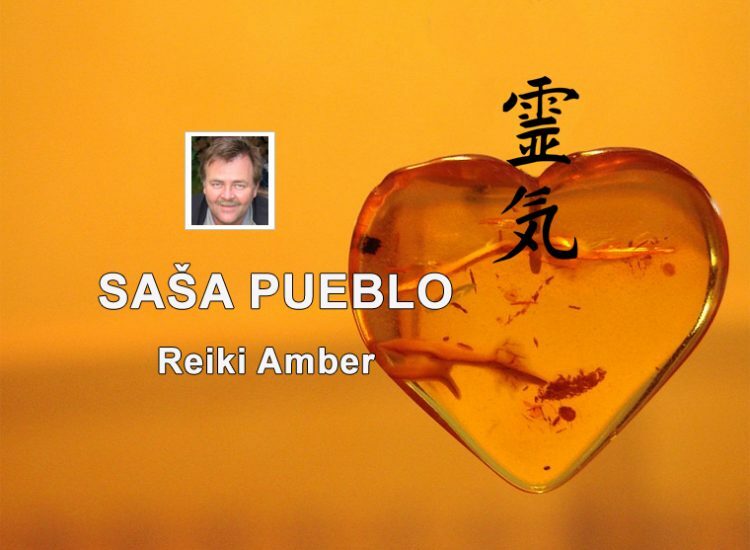 The whole problem of amber Reiki lies in the fact that there must be a source of negative electron charge. This can be reached through healing foil or the introduction of new pieces of amber. We could get something from supply of tree resins such as cherries or plums resin. Searching or buying of amber or medicinal tape consumes time and money. Of course Reiki person has also other ways how to supply yourself with negative electron charge. And that is remote connection to resin, amber embedded in the nature or to persons who process amber. Or edit own energy system, mainly mitochondria – tiny organelles in each cell. Adjustment happens through people who still have own or other source from the nature. Amber is petrified sap – golden yellow color resin, can be milky white, green, reddish orange or black. Amber is also used in medicine, has anti-inflammatory and immunological properties, calms nerves, stimulates the intellect, absorbs negative energy..
Polimedel is a polymer film made for the army. The foil speeds the rehabilitation of wounded soldiers. It is made with a special manufacturing technology, to obtain practical permanent negative charge. It is the electrical equivalent of a permanent magnet. Permanent electret thus permanently polarized object practically does not exist in the nature but close to it is amber..
Polytetrafluoroethylene is a fluorinated polymer which is known mainly under its trade name teflon. It belongs to a thermoplastic, the melting point of approximately 327° C, but its characteristics are changed even at 260 ° C, above 350 ° C results in decomposition..
As reported by ancient Greek mathematician Thales of Miletus around 600 BC, charge (or electricity) could be accumulated by rubbing fur on various substances, such as amber. The Greeks noted that charged amber buttons could attract light objects such as hair. If the amber is polished long enough, may even skip the electric spark. This property derives from the triboelectric effect.. The natural resin is an organic product of some plants (vegetable resin), and occasionally also of some animals (e.g. shellac), which has the form of a combustible, non-conductive usually brownish or yellowish, solid or semi-solid having a glassy quarry, is soluble in the other organic substances and insoluble in water..
Damara is a natural resin. From shrubs and trees, growing in tropical zones (dammar tree – Agathis) are collected bright yellow nuggets..
Gumiguta is a Siamese resin of a tree from India or Ceylon. It is dissolved in water, it was used once in watercolors, but because of its toxicity is only used for coloring of violin. It has mustard dark yellow color..
Copal is recent or subfosil hard resins from conifers, especially from the family Copaifera. In Central American cultures is used as incense and in past was used in the manufacture of varnishes. Copal has honey and amber color, soluble in ether, acetone and alcohol. Still used in the restoration of paintings and as an ingredient of violin making varnish, it gives a hard, glossy finish..
Hymenaea Proter is extinct prehistoric tropical tree from the family of Bob a probable ancestor of today Hymenaea species. It includes about 30 species distributed mainly in tropical America. Kurbaryl common (Hymenaea Courbaril) provides a resin called copal..
Benzoate, also benzoin resin or gum benzoin, balsam resin is obtained from the bark of several species of trees of the genus Styrax. It is used in perfumes, incense, joss sticks and medicine. The main component is benzoic acid..
Copaline, also called fossil resin is a naturally occurring organic compound found as irregular pieces of light yellow color. Copaline is Copal, which was partially mineralized..
Kauri gum is petrified resin which is extracted from the kauri trees, resin leaked out tears or cracks in the bark..
Kauri Museum at Matache is one of thematic museums of New Zealand, tells the story of pioneering settlers..
Fossil resin, fossilized vegetable juices ancient trees retained in various sediments are collectively referred as amber.. The resin is a secretion which contains mainly hydrocarbons and is produced by a number of plants, particularly coniferous. It is used for example. for the production of varnishes, adhesives and incense or perfume. Fossilized resin is known as amber. As resins are also called synthetic products with similar properties. Resin is also contained needles of trees, some species even directly secrete from needles (Pinus aristata)..
Amber is a mineralized tertiary rest resins of conifers, old about 50 million years. The color is yellow, a tan to brown, but we can also find varieties completely transparent, red, coffee and white. It is located in Europe as a petrified pine resin. Amber is used mainly in the manufacture of jewelery and ornaments..
Category – amber by location. Amber room – a room in Catherine Palace in Pushkin Russian city. Jet (lignite) – black amber is dark amber mineraloid used as a gemstone. In earlier times used to be confused with amber. It is wax matte black or dark brown and opaque. Originated billion years of wood decay, usually from the family tree Araucariaceae under high pressure. Its composition is similar to brown coal and burns..
Baltic amber is type of higher mineralized resin, up to 8% share of succinic acid. The largest deposits are located in the Baltic region. It is estimated that 90% of the world reserves of amber is located in Kaliningrad region. The process of creating a Baltic amber dates back some 44 million years ago, from tertiary forests was created around one hundred thousand tons of amber. Caribbean orange amber from the island of Hispaniola in the Caribbean is found in different natural colors, among them fluorescent green and blue. Dominican amber could be old up to 40 million years..
Dominican amber is from the Dominican Republic, from Baltic amber is distinguished in that it is almost always transparent and has a higher number of fossil inclusions. This allowed a detailed reconstruction of the ecosystem in long disappeared tropical forest..
Mexican amber formed during the late oligocene in southwestern North America. Amber as other origin may contain inclusions such as prehistoric insects or other arthropods, as well as fragments of plant or epiphytic fungi..
Green Baltic amber dating back 30-60 million years. Through the same natural process as the other, the difference is actually the color, some fresh green leaves of amber gave the amber their green pigmentation before they petrified.. The legendary Mayan Chiapas amber from mines in Chiapas in Mexico is red, blue, green and amber color naturally.. List of different types of amber, sorted by country and location. Countries are listed in order of the youngest kind of amber..
Amber and insects, mosquitoes, ants, Baltic amber, Dominican …. Amber and its properties – general, physical, optical, links to other databases for amber..
Amber in United States, Baltic region, Dominican Republic, Mexico, Canada, Japan..
House of Amber – top quality amber in silver and gold, decorated with diamonds in the most exclusive classic and modern design.. The origins of the history of amber, the discovery of deposits which dates back to the earliest period of human history – the Stone Age.. The earliest discoveries of amber products come from the Middle Paleolithic era (about 300 to 40,000 years BC)..
Amber collection of more than 700 samples of different sizes, shapes, colors and degree of transparency, among them many, including animal and plant inclusions.. Private amber museum exhibits the most interesting pieces of amber inclusions and come from the private collections of the museum owner Wojciech Głodzika..
Video Museum Bursztynnictwa w Jantarze. Among exhibits is the world second largest piece of amber, a collection of over 3.000 amber inclusions and one of the most famous organic inclusions is small lizard.. The museum contains a collection of unique pieces of amber, fossilized resin of trees from over the world..
Amber museum collection includes about 28.000 units, of which about 15.000 contain inclusions of insects, spiders and plants and about 4.500 exhibited pieces of amber objects are many works of art jewelry..
Museum in Chiapas on Facebook. It is one of the most respected museums of amber in the world. Museum organizes an impressive collection of amber antiques and artifacts..
House of Amber is one of the oldest and the world largest manufacturers of exclusive amber jewelery. Baltic amber – collection, history, varieties, usage in medicine, amber and Mary.. The Amber Museum has unique pieces of amber from North Kordillier. Amber which originates from these areas and nowadays belongs to Dominican Republic is 20-60000000 years old. More rarely foundations contain bodies of insects and leaves..
Amber old 92 million years from New Jersey, orange amber specimens and inclusions, collectors, site preparation and research..
Over six years have been carried out about 20 lbs of amber which collectors have donated to American Museum of Natural History..
New Jerse excavations of amber. Authentic specimens of Dominican amber for sale, which have been excavated in amber mines at La Buca, Palo Quemado, Pescado Boo Boo, El Valle and La Toca..